Vladimir Putin called President of Kyrgyzstan Almazbek Atambayev to congratulate him on his birthday, wish him success in his responsible work and good health. 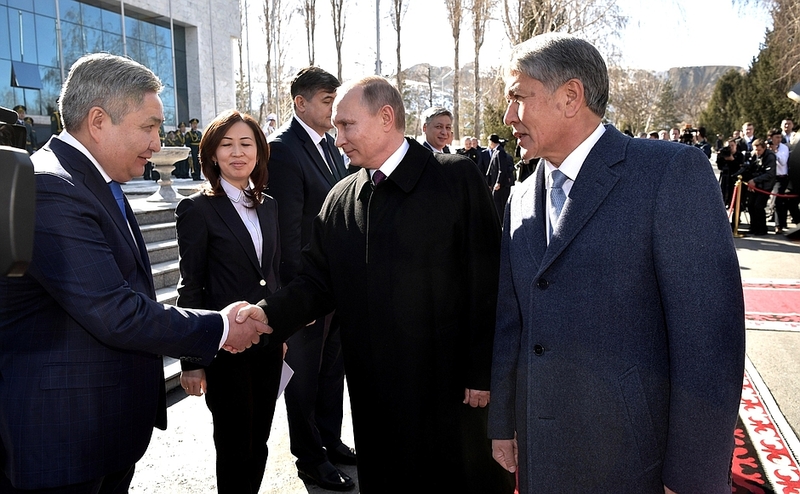 Vladimir Putin congratulated President of Kyrgyzstan Almazbek Atambayev. "Your activity as the head of state, focused on solving Kyrgyzstan’s current socioeconomic development issues and enhancing its international position, has earned you the well-deserved respect of your fellow countrymen and high respect from abroad. Russia highly appreciates your personal contribution toward strengthening our strategic partnership and the allied relations between our two countries, and promoting constructive interaction within the EAEU, CSTO and other multilateral structures." 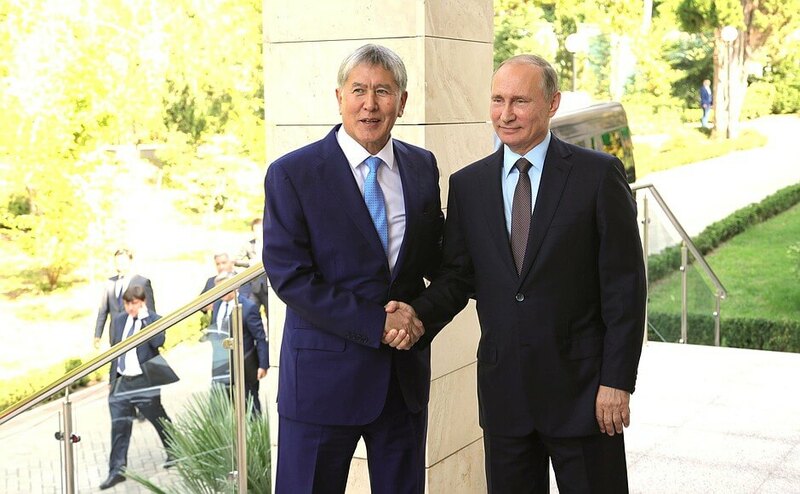 Vladimir Putin met at his Bocharov Ruchei residence with President of Kyrgyzstan Almazbek Atambayev, who is in Russia on a working visit. 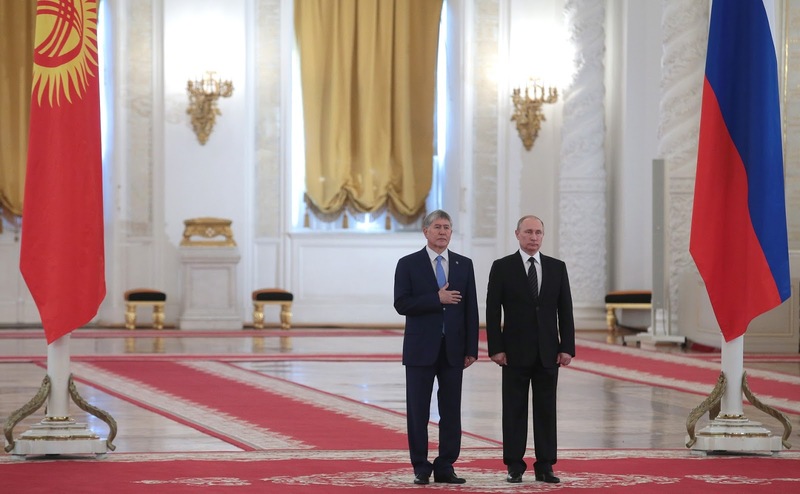 The discussion of Vladimir Putin and Almazbek Atambayev covered various aspects of bilateral cooperation. 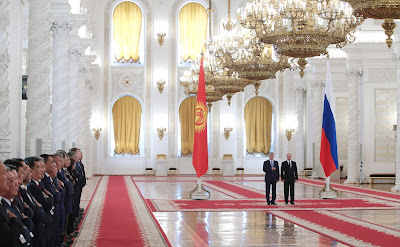 Vladimir Putin with President of Kyrgyzstan Almazbek Atambayev. Mr. Atambayev, friends, it is a great pleasure to welcome you once more in Russia, in Sochi this time. We meet on a regular basis, which is good, as we always have plenty to talk about. Our relations and cooperation continue to grow therefore there are always current matters that require timely discussion. I was speaking with my colleagues just before this meeting about the way our contacts are developing and I am pleased to say that we are happy with the situation overall. Our bilateral trade is growing and we are making progress in practically all areas. 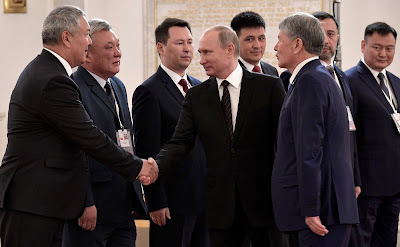 Vladimir Putin at a meeting with President of Kyrgyzstan Almazbek Atambayev. 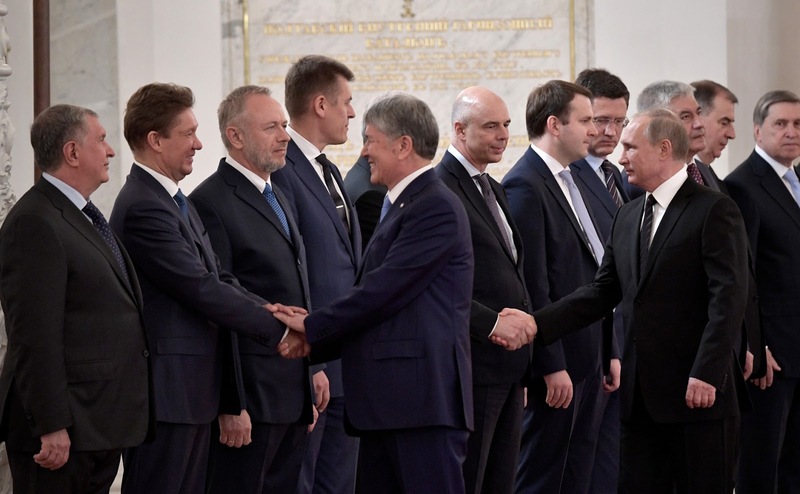 We also note, as you have mentioned as well, that following Kyrgyzstan’s accession to the Eurasian Economic Union, economic ties have intensified with the other EAEU members. These are positive trends and we are very pleased to see this. Of course, there are some issues to which we should probably pay greater attention. I am very happy that you found the possibility to come here today to discuss these various matters. Welcome! Of course, every opportunity to discuss our bilateral relations is important. I am pleased because different issues come up each time we meet, but I can say quite frankly that I am always met with understanding on your side. 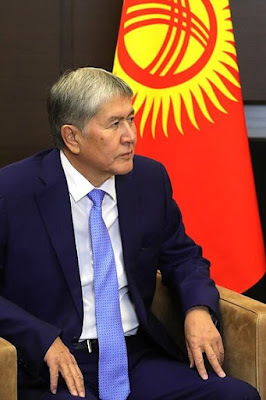 President of Kyrgyzstan Almazbek Atambayev. 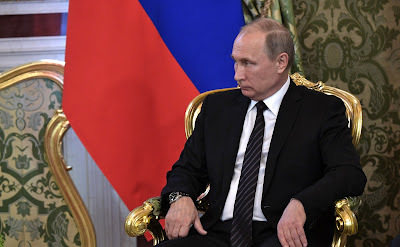 I remember that last time we met in Moscow, we discussed what some might think are minor matters such as driver’s licenses for migrants and other issues. Solutions are found in each case and I would like, of course, to settle as many issues of this kind as I can before my term in office comes to an end. I am pleased that we still have several meetings ahead before the year ends. I hope that we will do all possible not only to build on the level of relations our two countries have reached, but to raise this level even higher. 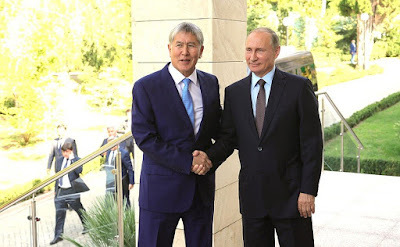 Vladimir Putin met at his Bocharov Ruchei residence with President of Kyrgyzstan Almazbek Atambayev. Putin congratulated President of Kyrgyzstan on Independence Day. 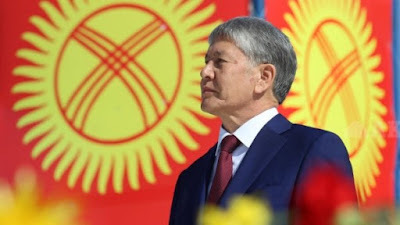 Vladimir Putin sent a message of greetings to President of Kyrgyzstan Almazbek Atambayev on the national holiday, Independence Day. 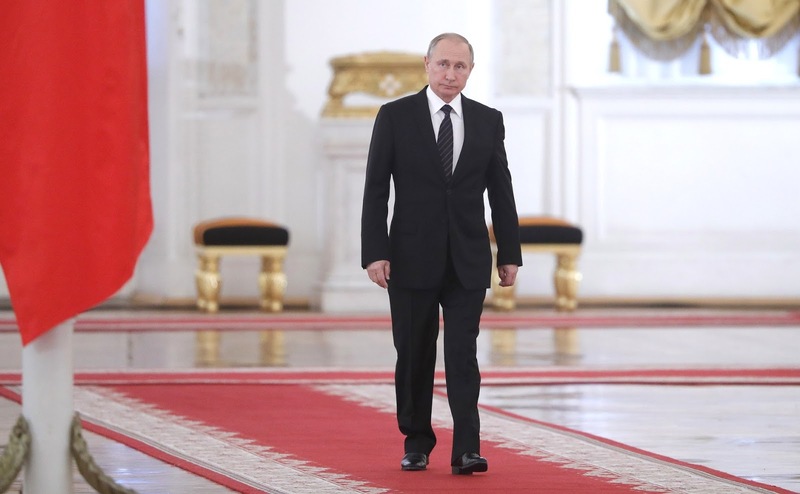 Vladimir Putin expressed appreciation of the Russian-Kyrgyzstani relations, which are developing sustainably in the spirit of strategic partnership and alliance. 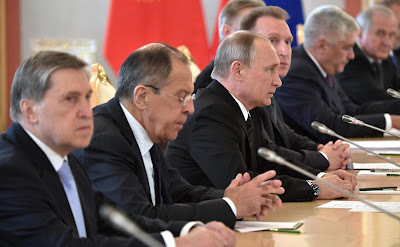 “Our countries have developed a purposeful political dialogue and fruitful cooperation in many spheres, as well as effective interaction within the framework of the Eurasian Economic Union, the CSTO and other international organizations,” the Russian President’s message reads. Putin had a telephone conversation with President of Kyrgyzstan. Vladimir Putin had a telephone conversation with President of the Republic of Kyrgyzstan Almazbek Atambayev. 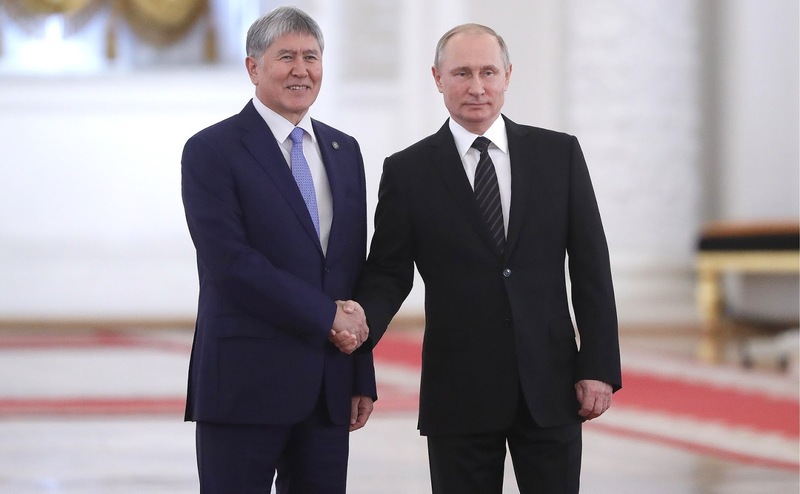 Putin and Atambayev discussed bilateral cooperation in the context of implementing the agreements reached during Mr. Atambayev’s state visit to the Russian Federation on June 19–24, 2017. Press statements following Russian-Kyrgyzstani talks. Following their talks, Vladimir Putin and Almazbek Atambayev made statements for the press. 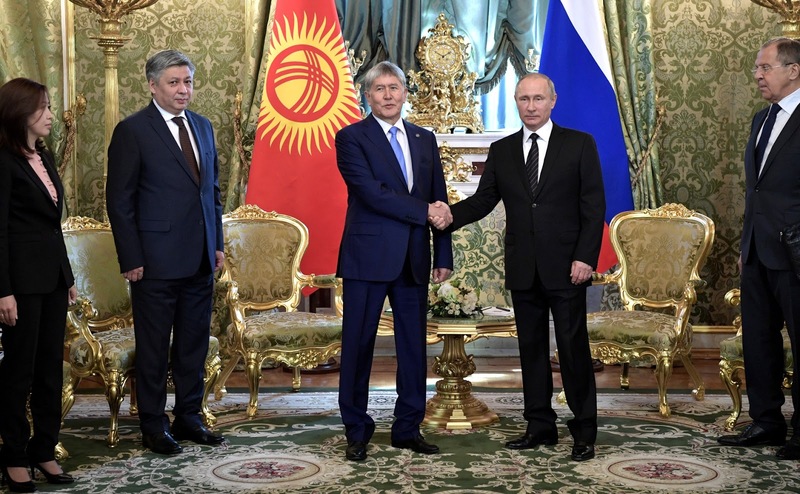 Vladimir Putin and Almazbek Atambayev, press statement for the press following Russian-Kyrgyzstani talks. I am glad to welcome the President of Kyrgyzstan in Moscow. We meet regularly. We held substantive talks in Bishkek in February and saw each other at a meeting of the Supreme Eurasian Economic Council in the capital of Kyrgyzstan and recently at the Astana Summit of the Shanghai Cooperation Organization. 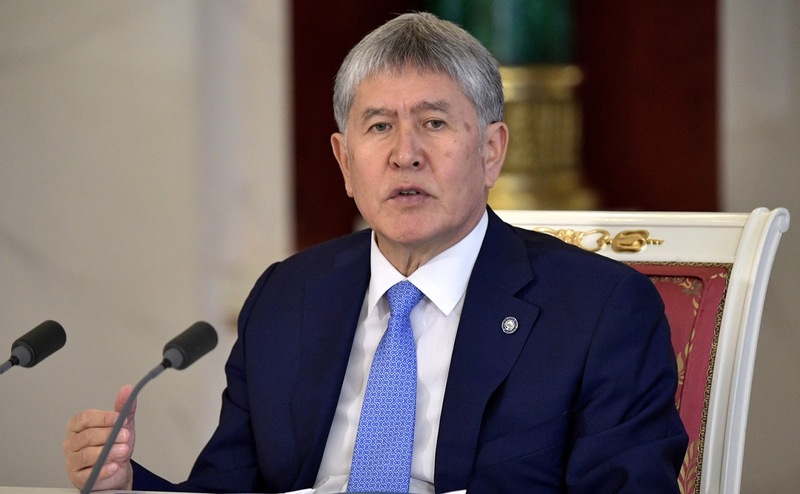 Mr. Atambayev comes to Russia often, but this time is different: he is making a state visit. It is symbolic that this visit is being held in the year when we mark the 25th anniversary of Russian-Kyrgyzstani diplomatic relations and the Treaty of Friendship, Cooperation and Mutual Assistance. In the past 25 years, relations between our countries developed in all areas based on mutual respect and consideration for each other’s interests and have reached the level of strategic partnership. As usual, our talks with the President of Kyrgyzstan were held in a friendly and constructive spirit. We discussed the key issues on the bilateral agenda and also current regional and international matters. The talks we have held with government members and business leaders focused on Russian-Kyrgyzstani relations, primarily trade and economic cooperation. We noted with satisfaction that we have reversed, overall, the negative trend in mutual trade that was caused by global market instability. In the first quarter of 2017, our trade increased by 23 percent. Russian exports to Kyrgyzstan grew 24 percent and imports from Kyrgyzstan by 15 percent. The deliveries of foods and agricultural raw materials, which are vital commodities for Kyrgyzstan, have increased more than 150 percent. 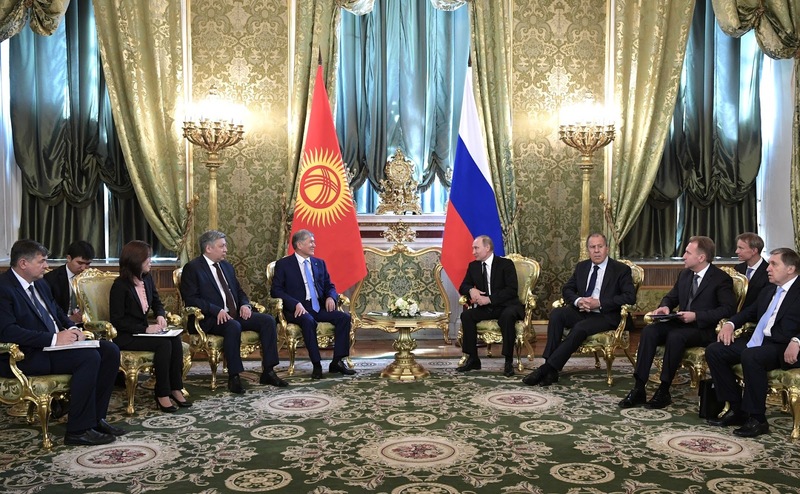 Notably, Russia continues to help the economy of Kyrgyzstan. Our financial assistance is mostly uncompensated. The Russian-Kyrgyz Development Fund is operating successfully, with Russia investing $500 million in its authorized capital. The fund has provided financing to 28 major projects in Kyrgyzstan. Another 700 diverse projects have received loans in the amount of over $230 million from Kyrgyz commercial banks under the Small and Medium-Sized Business Support Program. In addition, Russia annually provides $30 million to support the state budget of Kyrgyzstan. 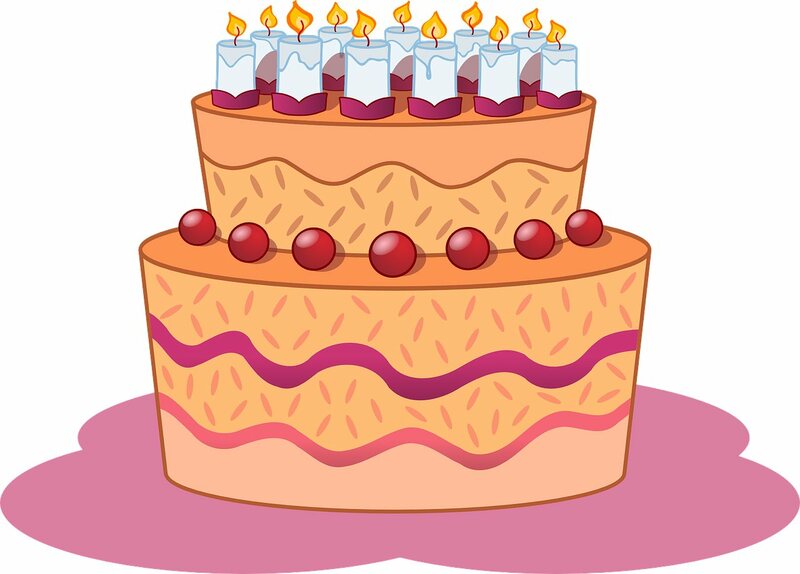 Since 2012, the cumulative amount of such grants has amounted to $255 million. Russia has allocated another $200 million to adapt the Kyrgyz economy to the terms and conditions of membership in the Eurasian Economic Union. Significant investments in Kyrgyzstan come from Russian commercial organizations. For example, the amount invested by Gazprom into upgrading the Kyrgyz gas distribution system will reach 100 billion rubles in the coming years. As a result, the provision of gas supply in that country should go from the current 22 percent to 60 percent. Money transfers by its citizens working in Russia make a significant contribution to Kyrgyzstan’s economy. Last year, the amount of such transfers increased by almost 20 percent and amounted to almost $2 billion, or one-third of Kyrgyzstan’s GDP. Such transfers grew by another 67 percent in the first quarter of this year. Kyrgyz citizens are granted preferential terms for employment, medical care and social assistance. Another focus of attention at the talks was expanding contacts between the regions of our countries. 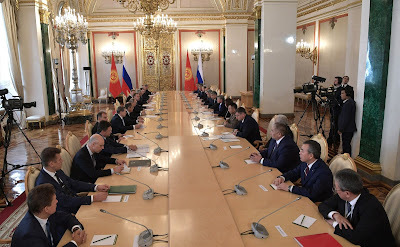 Currently, about 70 Russian regions cooperate with the Kyrgyz Republic. 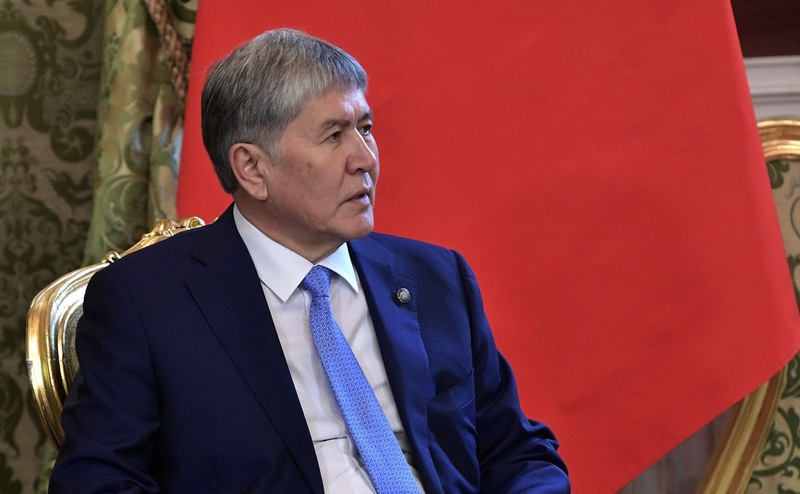 We expect that bilateral regional exchanges will be further boosted by the President of Kyrgyzstan’s travels to Bashkortostan and Tatarstan as part of the current visit. I'm sure you'll like it there, and it will be an interesting visit since they are fast-growing Russian regions. We had a detailed discussion on the expansion of integration processes in the Eurasian space, as well as on our cooperation within the CIS, the CSTO, the SCO and the UN. 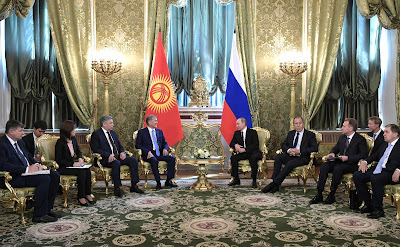 Russia appreciates Kyrgyzstan’s efforts as the current Chair of the Eurasian Economic Union. We support the priorities of the joint work within the EAEU suggested by Kyrgyzstan as the EAEU Chair, including stepping up integration processes, and further reducing administrative and technical barriers in trade among EAEU member states. Military-technical and defense cooperation is an important element of the strategic relations between Russia and Kyrgyzstan. I strongly believe that the contract we signed today to promote military-technical cooperation will make a substantial contribution to further enhancing Kyrgyzstan’s defense capabilities. Today we also reaffirmed our shared understanding that the presence of a Russian military base in Kyrgyzstan is an important factor of stability and security in Central Asia in keeping with the long-term interests of our countries and our CSTO allies. We agreed with our partners from Kyrgyzstan to continue closely coordinating our efforts to combat terrorism and the spread of extremist ideology, proposing to step up cooperation on counter-terrorism within regional organizations, including the specialized services of the CSTO and SCO. We exchanged views on the prospects for stepping up cultural and humanitarian cooperation. 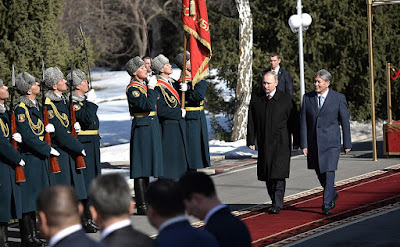 The visit to Russia by the President of Kyrgyzstan was arranged to coincide with the opening of the Days of Kyrgyzstan in Russia, and last year the Days of Russia were held in Kyrgyzstan. We agreed on providing further incentives for educational exchanges, which enable Kyrgyzstan residents to obtain quality higher education and improve their Russian language skills. Some 17,000 students from Kyrgyzstan are currently enrolled in Russian universities, including more than 5,000 students who benefit from scholarships funded by Russia’s federal budget. In conclusion, I would like to sincerely thank Mr. Atambayev and all our Kyrgyz friends for the constructive atmosphere at our talks. We coordinated new large-scale tasks on developing bilateral relations, which are reflected in the just signed Declaration on Strengthening the Alliance and Strategic Partnership between the Russian Federation and the Kyrgyz Republic. I am convinced that the declaration as well as other documents signed as a result of the visit will help promote Russian-Kyrgyz cooperation in the most diverse areas and spheres. And in conclusion, I would like to add that we know that the President of the Republic’s time in this high office is coming to an end. I would like to thank Mr. Atambayev for what he has done for the development of Russian-Kyrgyz relations and for what he is doing to promote and support the Russian language in Kyrgyzstan. We are in a position to appreciate it and we do appreciate it. We would like to thank you for laying such a solid foundation for the development of bilateral ties in the mid-term and, I hope, long-term perspective. Thank you for the high praise of my work. I agree that the foundation that has been laid in the past five or six years is very solid, as you put it. This is probably one of my achievements that I will always recall with pride till my final days, so to speak. And I would also like to thank the Russian side and you Mr. President for your warmth and hospitality on my own behalf and on behalf of our entire delegation. As you said, our relations have undergone a profound transformation. We have managed to raise relations to the level of strategic partnership and, owing to your personal involvement, we have carried out major projects in the economy, trade and strengthening Kyrgyzstan’s defense capability. And, in addition to that, I would like to note that Russia has granted us significant financial aid. 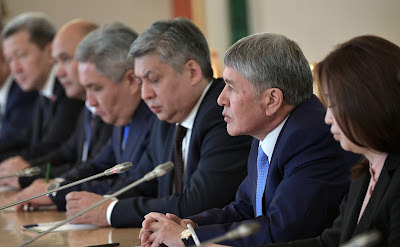 Today our finance ministers exchanged a protocol on Russia writing off all of Kyrgyzstan’s debts, all remaining debts. And when we discussed the agenda today, we saw that we have practically no differences – just plans and prospects for the future. 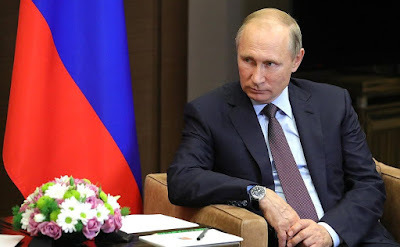 Since joining the Eurasian Economic Union, we have seen a sharp increase in trade – by 23 percent, as you observed, and the growth of money remittances from our migrant workers. Most importantly, we see that the lives of the Kyrgyz citizens who work here have become much easier. It is good that we are seeing quick results, because we remember the massive attack in our country and some other countries aimed at preventing Kyrgyzstan from joining the Eurasian Economic Union. We see that joining has lived up to our expectations. Of course, much work remains to be done, but we can feel the support of fraternal Russia in this area as well. I am pleased that we have managed to maintain close cultural ties. Of course, we need to further strengthen them. Today, the Days of the Kyrgyzstani Culture kick off in Russia with a big concert at the Kremlin Palace of Congresses. This is an excellent opportunity to reinvigorate this activity. Ties between regions are fairly strong. Of course, Mr. President, I'm really pleased to have the opportunity to visit Bashkortostan and Tatarstan. As you may be aware, my wife was born in Russia, and she is probably even more pleased at the prospect. There are members in our delegation with Russian roots as well. We have managed to maintain a diversity of voices and languages in Kyrgyzstan. I am very pleased, in fact for me it is high praise, Mr. President, that a foundation has been laid, as you mentioned, not only for medium-term cooperation. I believe it will last forever. On July 20, we will hold a large international forum in Kyrgyzstan attended by representatives of dozens of countries of the pra-Altaic civilizations. While some of them may have even forgot it, they come from Altai, and are representatives of the Altai civilization, including Kyrgyzstan. Of course, for us, Russia is our ancestral homeland. Our legendary hero Manas, the father of our people, also comes from Altai. Therefore, I am absolutely convinced that not only this ancient history binds us; of course, our common future will bind us as well. I cannot imagine the future of Kyrgyzstan without Russia. Today, the representatives of the government and representatives of all parties represented in Kyrgyzstan’s parliament attended the talks. There are six parties in parliament, and all representatives of the parties are in favor of friendship and brotherhood with our great Russia, brotherly Russia. In closing, I would like to once again thank President Vladimir Putin, the members of the Russian Government, the heads of ministries and departments, the State Duma deputies, and the Federation Council members, who have always supported Kyrgyzstan. On behalf of the people of Kyrgyzstan, I thank you for the support that we always feel. 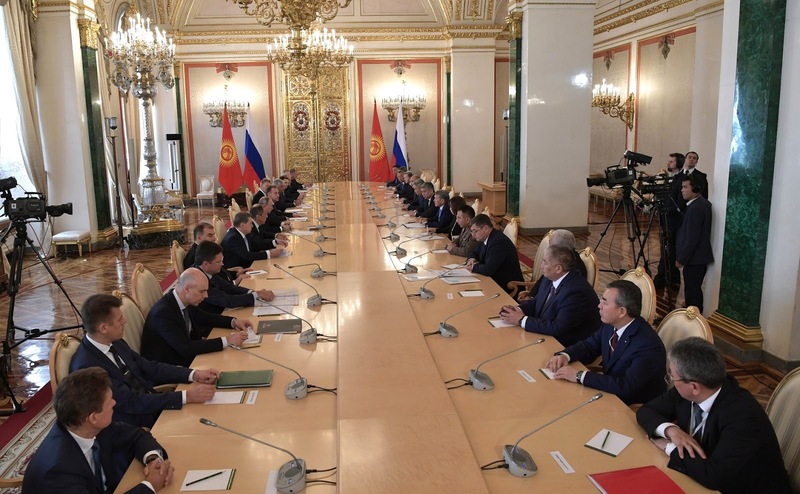 Beginning of Russian-Kyrgyzstani talks in the expanded format. Vladimir Putin held talks with Almazbek Atambayev in the expanded format. 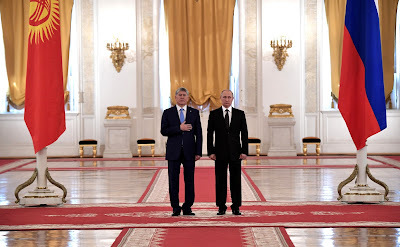 Vladimir Putin and Almazbek Atambayev in Moscow. I am glad to welcome you at this expanded format meeting. We have discussed bilateral issues, our ongoing projects and plans for the future in great detail. I suggest that we now give the floor to our colleagues – ministers and heads of agencies – who are responsible for the implementation of our strategic documents. We have with us today the ministers and heads of companies that are working in Kyrgyzstan. I propose we start with them after we listen to what President of Kyrgyzstan has to say. To begin, I would like to thank you for your warm and heartfelt welcome and for your understanding of our problems. We are also grateful for the considerable support we have received from Russia during my presidency and also in 2011, when I was prime minister. I am glad that our relations have moved from mistrust and mutual complaints to mutual understanding. We have reached a new level of relations based on strategic partnership. Also, I would like to say that our relations, especially economic cooperation, have grown stronger since Kyrgyzstan acceded to the Eurasian Economic Union. Despite gloomy forecasts, our accession to the EAEU has given a powerful boost to Kyrgyzstan’s economic development. We have just discussed the figures at the restricted meeting, mentioning 20 percent and 30 percent increases. Of course, ordinary Kyrgyzstani nationals who work here could not fail to feel the difference in terms of their working environment. I would like to take this opportunity to highlight the success of the Kyrgyzstan-Russia Development Fund. I would also like to thank the intergovernmental commission, as well as Russian ministries and agencies for providing various kinds of assistance to Kyrgyzstan. Of course, we should not forget the cultural and humanitarian dimension of our relations. It is highly symbolic that today we will be inaugurating at the Grand Kremlin Palace the Days of the Kyrgyzstani Culture in Russia. On July 20, we will welcome Russian researchers and experts at the forum Altai Civilization and Related Peoples of the Altai Language Family, since it is high time that we emphasize that Russia is the ancestral home not only for the Kyrgyz people, but also for a number of other Central Asian nations. I hope that Russia will be well represented at and actively contributes to the forum. I would also like to say that our two countries share a long-standing, millenary history. I strongly believe that we also have a shared future ahead of us. 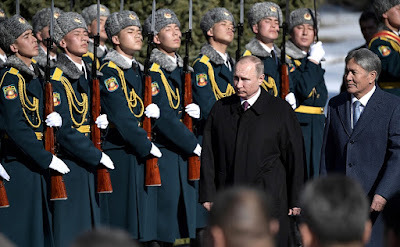 As I told you today during the flower-laying ceremony at the Eternal Flame and the Tomb of the Unknown Soldier, I thought that this Unknown Soldier could be my great uncle Kulmambet Atambayev, who died somewhere in Russia, and we do not know where he was buried. This is our shared history, and I am confident that we must preserve our brotherhood and friendship. We should definitely have a shared future. Russian-Kyrgyzstani talks in the expanded format. Almazbek Atambayev. Russian-Kyrgyzstani talks in the expanded format. Vladimir Putin. Russian-Kyrgyzstani talks in the expanded format. Russian-Kyrgyzstani talks in the restricted format. 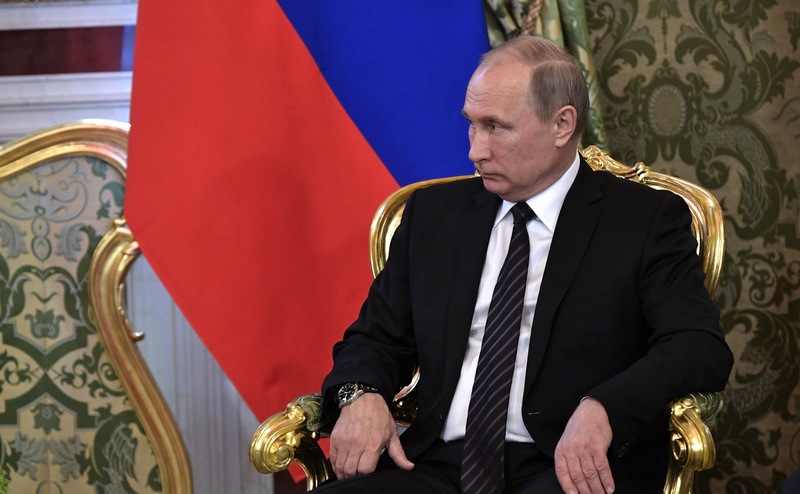 Vladimir Putin held talks in the restricted format with President Atambaev at the Kremlin. Vladimir Putin and Almazbek Atambayev. I am happy to welcome you to Moscow. 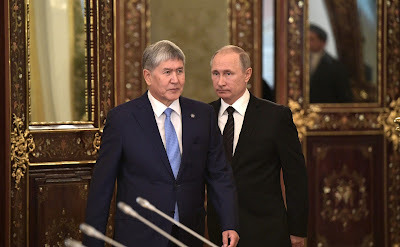 President Atambayev and I met yesterday in an informal setting and discussed the entire range of bilateral issues, as well as regional and some international questions. I am glad that we have an opportunity to meet in both restricted and expanded formats for substantive discussions on the development of our bilateral relations, our recent achievements – we have accomplished a great deal – and our plans for the future, including in the multilateral format of the Eurasian Economic Union, as well as on regional issues. We are very close allies and reliable friends. We are aware of the transformations that took place in Russia in the past and in Kyrgyzstan in the past decade. We sincerely hope that this period of instability is over. Thanks to Mr. Atambayev’s efforts, the situation in Kyrgyzstan has normalized and is irreversibly on the path of positive development. I congratulate you on this achievement. I hope that the achievements you made during your presidency, which will end in the next few months, will be carried on, and that we will continue to strengthen our bilateral relations and the situation in the region as a whole. Yesterday we had a good opportunity to summarize the results, because, as you said, I have just a few months left, before Kyrgyzstan has a new President. I would like to assure you that Kyrgyzstan would certainly never turn off this road found as a result of difficult pursuits. 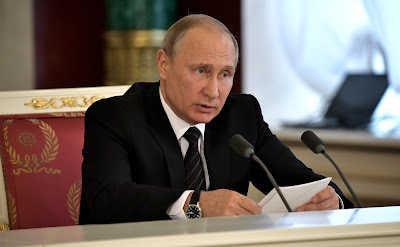 And, summing up the preliminary results of my work, I think one of the main achievements for the years of my presidency is that we have navigated our relations with Russia exactly into the channel of strategic cooperation, of friendship and brotherhood – the way they should be. We in Kyrgyzstan know that Russia is our greater homeland, as our roots are the Altai civilization. And of course, we should always be together. We should always be together and continue the work of our fathers. I would like to thank our Russian partners, the Russian Government and you personally – over the years of my work, one year as prime minister and six years as president, Kyrgyzstan has received immense help. I could cite the figures, but there was moral support as well – I felt it was always there, as you have said, truly fraternal support. 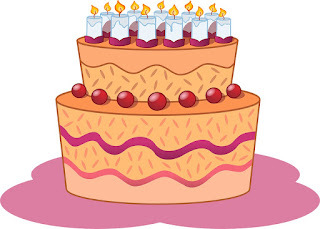 This, of course, helped us overcome many difficulties and problems. Once again I want to say that the situation in our country is completely different now. Most importantly, I am pleased about the prevailing attitude that this is what our relationship with Russia should be like, that there must be stability in the country. The country should grow; it should engage in political games less and take care of its economy more. I am grateful for your invitation, for the respect, cordiality and warmth I see here every time. Russian-Kyrgyzstani talks in restricted format. 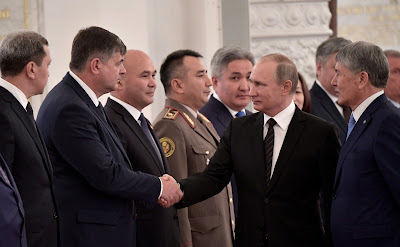 Vladimir Putin held talks in the Kremlin with President of Kyrgyzstan Almazbek Atambayev, who is in Russia on a state visit. During the restricted format meeting, the two presidents discussed topical bilateral issues. Later the talks continued with the delegations’ participation. The official welcome ceremony took place before the talks. The two leaders also introduced the members of their delegations. A package of documents has been signed during the state visit by the President of Kyrgyzstan. 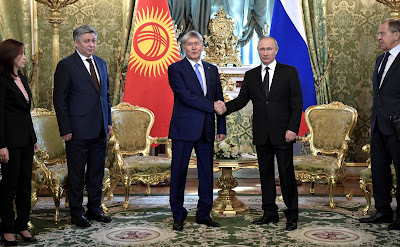 Vladimir Putin and Almazbek Atambayev signed a Declaration on Strengthening the Alliance and Strategic Partnership between the Russian Federation and the Kyrgyz Republic. Other bilateral documents include the memorandums on cooperation in finance, cartography and customs; agreements on cooperation in training personnel for the Kyrgyz bodies in charge of countering the legalization of criminal proceeds and the funding of terrorist or extremist activities; on cooperation to ensure epidemiological welfare with regard to the plague; and on the legal status of representative offices of the migration authorities. In addition, the two sides signed a protocol to the intergovernmental agreement on settling Kyrgyzstan’s debt on loans previously granted by Russia. A Treaty between the Russian Federation and the Kyrgyz Republic on the Development of Military-Technical Cooperation was also signed. 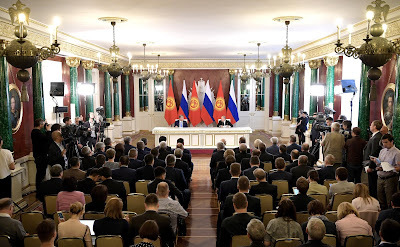 The presidents of Russia and Kyrgyzstan made statements for the press. Official welcome ceremony for President of Kyrgyzstan Almazbek Atambayev. 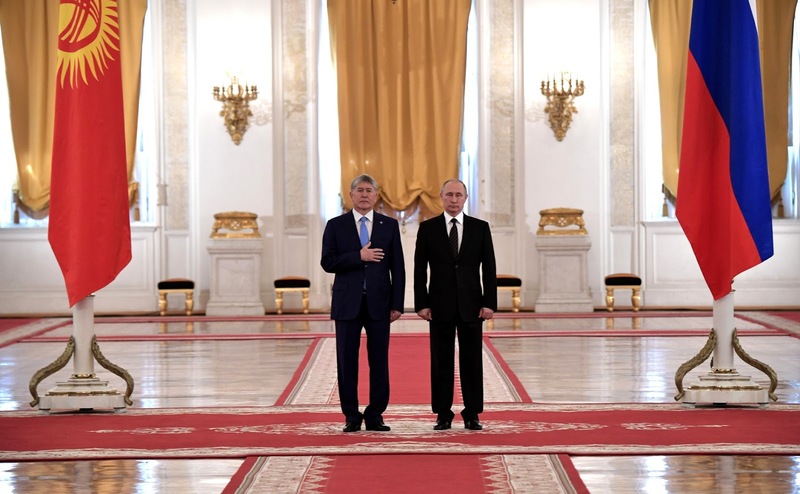 Russian President with President of Kyrgyzstan Almazbek Atambayev in the Kremlin. 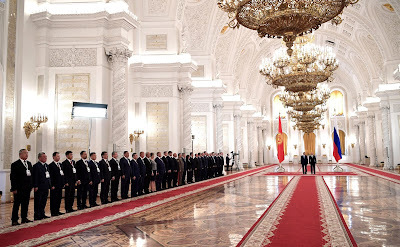 Official welcome ceremony for President of Kyrgyzstan in the Kremlin. Vladimir Putin with Kyrgyzstan delegation. Russian President greeting Kyrgyzstan delegation. 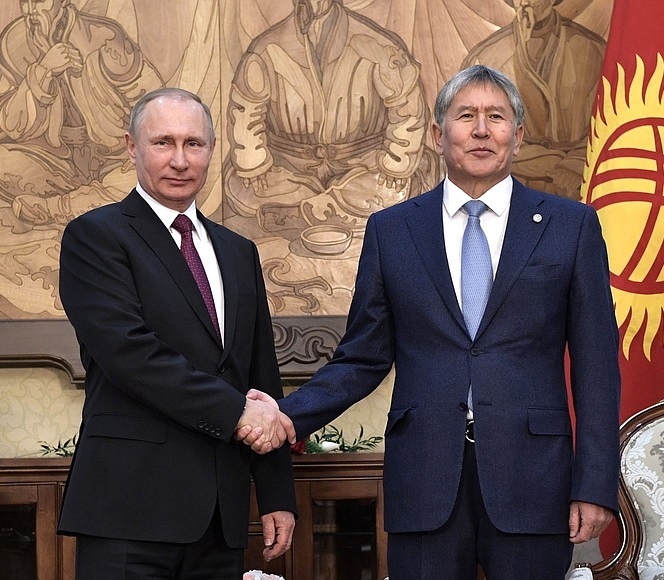 Vladimir Putin held talks with President of Kyrgyzstan Almazbek Atambayev. Russian President Vladimir Putin with President of Kyrgyzstan Almazbek Atambayev in Bishkek. 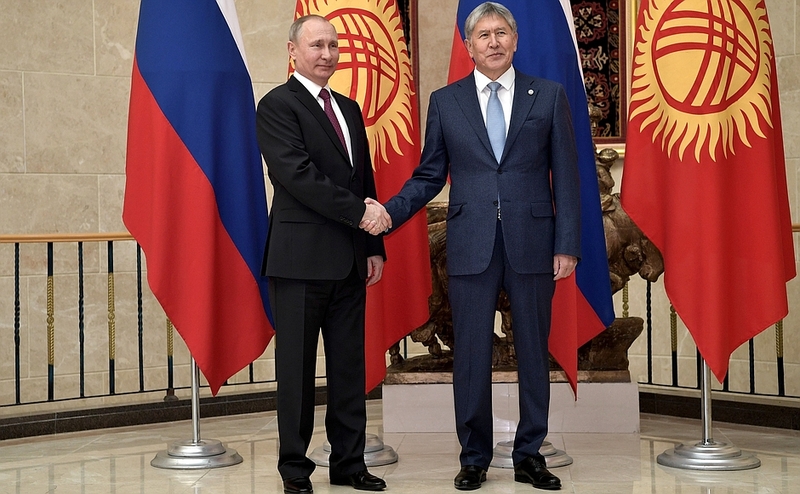 The talks featured discussions on political, economic and humanitarian cooperation between Russia and Kyrgyzstan, as well as prospects for expanding cooperation within the Eurasian Economic Union. 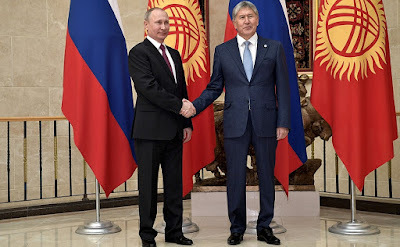 Following the talks, President of Russia Vladimir Putin and President of Kyrgyzstan Almazbek Atambayev signed a Joint Declaration. 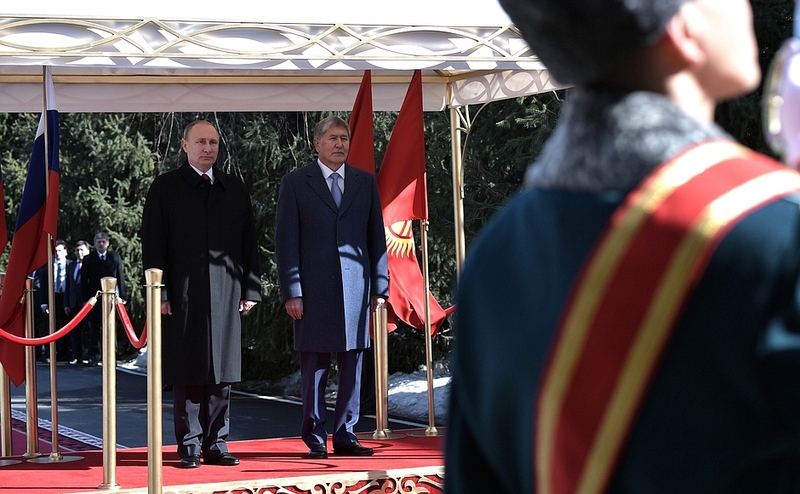 In addition, the two heads of state presided over the signing of the Protocol to amend and supplement the Russian-Kyrgyzstani Agreement on technical assistance to Kyrgyzstan as part of its accession to the EAEU dated March 31, 2015, as well as a Memorandum between Kyrgyzstan’s Healthcare Ministry and the Russian Federal Service for the Oversight of Consumer Protection and Welfare (Rospotrebnadzor) on cooperation in fighting infectious diseases. 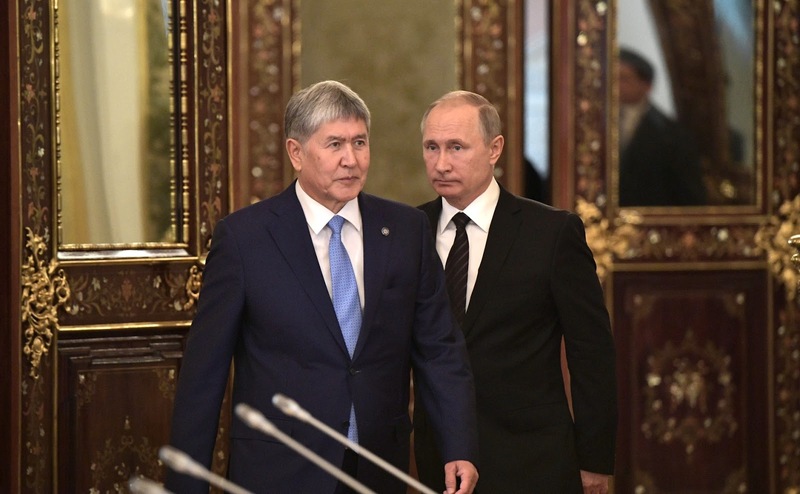 Vladimir Putin and Almazbek Atambayev held a joint press conference. 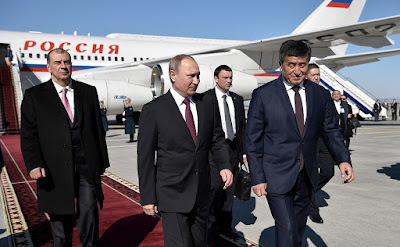 Vladimir Putin arrival in Bishkek. Russian President in Bishkek, Kyrgyzstan. Official welcoming ceremony. 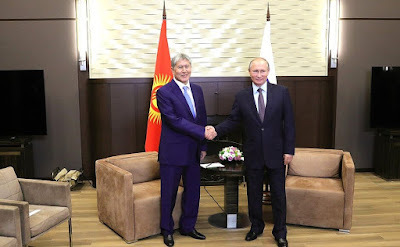 Vladimir Putin with President of Kyrgyzstan Almazbek Atambayev. President Putin and President of Kyrgyzstan Almazbek Atambayev. 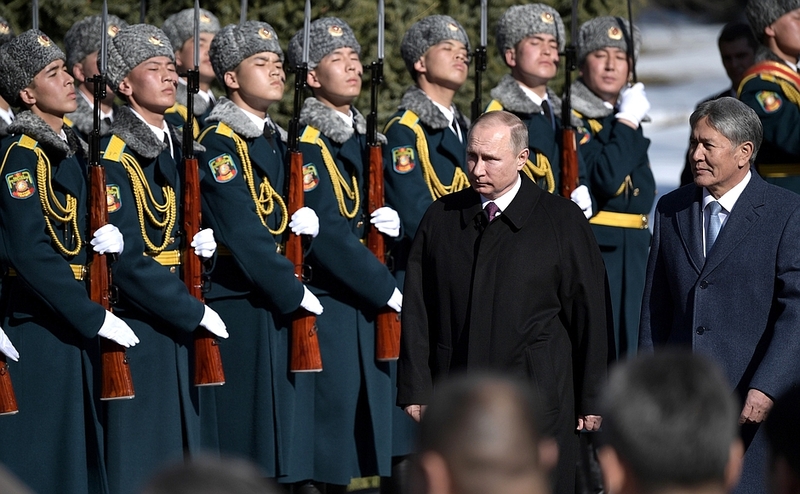 Vladimir Putin in Bishkek. Official welcoming ceremony.